Before we get started, let’s first review what Google My Business is. Mainly, Google provides a service to businesses to help them get more visibility. If you are searching McDonald’s on Google Search or Maps, a box will display with information about the business: location, hours, reviews and other relevant data. Millions of people search on the Internet daily. When you own a business, you want them to easily find you on Google. With Google My Business, the chances to be found on the Internet are high and users won’t need to carry out a thorough research to learn the key main points about your business. If you are not on the Internet, you don’t exist, that’s why it’s crucial to try to appear in search results and do it the best way possible: with info about your business and positive reviews. It will only take you a few minutes to configure your account and enhance the visibility of your business on the Internet. If you include all the info about your business, links to your social media profiles, etc. on Google My Business, it will help you to rank higher on search results. The business info and card on Google My Business will make easier to reach potential customers. You can manage all the business information displayed on Google and discover the users that search content about your business with Google My Business. When this information is verified by the brand, users will trust the business more. It’s an easy way to let potential customers learn about your company. Google My Business is the perfect tool to manage how your business will show on Google. When someone searches something related to your business, a box to the right of the search result might display with information about your business. These knowledge panels also appear on Google Maps when someone is searching on the area or somewhere close to your business location. Google My Business is very easy to use but if you master it, you can get the most from it and be able to optimize the visibility of your business. If you don’t have a Google My Business page, start one now to build a stronger brand image. Once you have created a page, fill out all the information that Google allows you to. The more information, the better for users. Once you fill out this data, Google will request that you verify the account. Depending on the type of business, you might see one or several verification methods. You will receive a verification code that you must submit to verify your Google My Business account. ✅ You should answer all the reviews: Both positive and negative ones. Users will get a better overview of your business. They will understand that you care about them and their opinion. Besides, you may solve some questions that future customers might have. You can also include CTA buttons, images, texts and videos. Be aware that these publications have an expiration date, they will disappear from Google after 7 days of being published. Now with Metricool, you can get the most from your Google My Business account. You can see all the metrics related to your Google My Business account with Metricool. 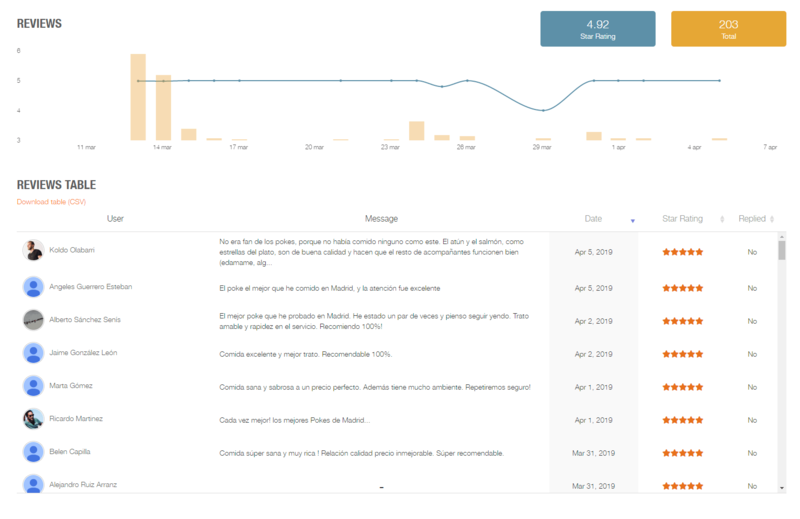 Choose the period that you want to analyze on the top-right corner of your dashboard. Keep in mind that Google only lets you analyze a maximum period range of 18 months and 3 days. Sign in to the Google account you used to create your profile. A list containing all your Google My Business profiles created with that Google account will display. Choose the one you’d like to connect and done! With Metricool, you will have access to all the analytics related to your Google My business account with all the information you need to optimize your profile and learn how your strategy on this platform is evolving. On this graph, you will obtain information about the type of searches made on both Google Search and Maps regarding your business. That is, the result shown in the graph is a combination of both. Let’s see an example about the Google My Business account of a McDonald’s in Barcelona to get a better understanding. Direct: When someone searches for a business directly, in this case: McDonald’s Barcelona. Indirect: When the search is generic. For example, Restaurants in Barcelona. In the first Google results will appear McDonald’s Barcelona. Chains: This metric gathers the information when the searches are about chains. Following the same example, it would be the times that the McDonald’s in Barcelona appeared in the first results when users look for McDonald’s, that is, the chain of restaurants in general. Total: The total number of searches, the sum of all the different ways to look for information about your business. You can also find out where your visits are coming from with Metricool. This metric is like the stats regarding impressions gathered for other social media accounts. For example, a visit is considered when we are searching for Starbucks on Google Maps, a pin appears indicating the location and we pass the mouse over it or in a more general search, when the panel knowledge about the business appears on the search results. Number of clicks on the button to access the business’s website. Number of clicks on the button to call and contact the business by phone. Number of clicks on the button to how to get to the business location. Total of clicks on all of the buttons combined. You will see the evolution of clicks on all the buttons on Google My Business in this Metricool graph. One key part of a Google My Business account are the reviews written by users about your business. Metricool provides you with an evolution graph showing the days that reviews are made and the evolution of your company’s average score. You can also monitor the reviews you replied to and which ones are yet to be answered. In this section, you can see in a graph and a table, the photos and videos uploaded directly by your business and by other users. Evolution of visits and photos. You can see when exactly the videos and photos were published. Table where you can see at a glance and organize all the photos and videos published on your Google My business along with other metrics: date, visits and type of publications. Last but not least, you can also review the metrics of your publications on Google My Business. Number of visits received by the publications over time. In the post table, you can check all the posts with the date they were published, the visits received and the type of publication. Metricool also lets you plan all the posts that you’d like to publish on Google My business. In the Planning section, click on New Post. A pop-up will appear automatically to add your post and see the preview of how it will show on Google My Business. Keep in mind that only accounts with less than 10 locations can publish posts, that is, less than 10 profiles on Google My Business. Add the text and image if you want to include one. If you’d like to add a button with more information about your publication, paste the link at the end of the post. Done! Your post on Google My Business has been successfully scheduled.